Some call it bin-diving and others call it garbage gleaming. You might call it dumpstering, but no matter what the term, it all means the same; dumpster diving. When you think of these terms you might have a vision of a homeless person digging for food, but nowadays, dumpster diving is a popular trend for many people who are diving in to save money on make-up and food, or even for those who want to create something new out of someone else’s junk. 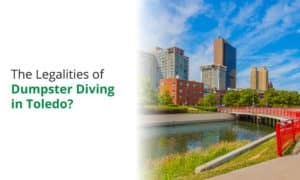 If the concept of saving a dime turns a light bulb on for you then before diving in you might ask, “Is dumpster diving illegal in Ohio?” So that you can get out there and start digging, we have already done the research for you. We have taken the time to check out the dumpster diving laws in Ohio and we have broken it down into the four largest cities in the state. In 1988 the case of California vs. Greenwood allowed the U.S. Supreme Court to rule that any trash set out for disposal becomes a free for all. This law makes dumpster diving legal but there are some restrictions and other laws that can get you in trouble if you’re not careful. So, is dumpster diving illegal in Ohio? Essentially the answer to that question is no, however, each municipality is entitled to their own laws when it comes to dumpster diving. You must also keep in mind that even if dumpster diving is legal in your area, littering, trespassing, vandalism, disorderly conduct, and identity theft are all illegal, so be careful that you don’t break any of those laws along the way. As we already mentioned, each city or town is entitled to their own ordinance against dumpster diving, so it’s important that you know and understand, not only the laws in that area but you must also know exactly where the dumpster is placed. You might think you are in one city or township only to find out you’re in another. If there are no laws against dumpster diving in your area, then it should be assumed it is legal. We did the research on the following four of the largest cities in Ohio. Let’s look at what the law says about dumpster diving in Columbus, Cleveland, Cincinnati, and Toledo. Is it Illegal to Dumpster Dive in Columbus? According to the Columbus code of ordinance 1305.07, it is illegal to remove any waste that is put out for collection unless a person obtains permission from the rightful owner before removing the waste from the property. Is it Illegal to Dumpster Dive in Cleveland? According to the Cleveland code of ordinance 551.081, the scavenging of recyclable materials is prohibited. So, this means that anything sitting out that is meant to be recycled cannot be taken. According to the Cleveland code of ordinance 551.082, the scavenging of solid waste materials is only illegal between 8:00 pm and 7:00 am or from sunset until 7:00 am if sunset should come before 8 pm. 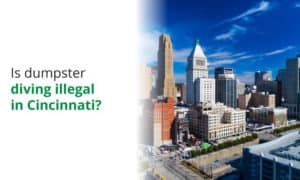 Is it Illegal to Dumpster Dive in Cincinnati? According to the Cincinnati code of ordinance 729-33, it is illegal to remove anything from the trash that is set out in alleys, public streets, or private property without permission from the owner. Is it Illegal to Dumpster Dive in Toledo? According to the Toledo code of ordinance 733.10, it is absolutely against the law to tamper with or remove any trash including recyclables that have been set out for collection. 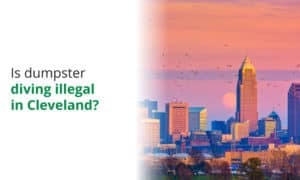 The Joslyn Law Firm of Franklin County states that trespassing in Ohio is considered a serious criminal offense and if you are convicted of criminal trespassing and it could be considered as a fourth-degree misdemeanor. That means you could be faced with a maximum of thirty days in jail and a $250.00 fine. If the damages are less than $75,000.00 you will be charged with a fifth-degree felony. If you’re convicted, you could be facing five years of probation with six to twelve- months of jail time. You may be slapped with up to $2500.00 in fines. If the damages exceed $75,000.00 you will be looking at a much higher penalty. The Ohio law defines litter as any trash that is thrown, discarded, or dropped onto public or private property that is not owned by the individual. It is also against the law in Ohio to throw litter into the waterways. If you’re caught littering you could get sixty days in jail and you will be facing fines up to $500.00. Under the Ohio conduct code, 2917.11 disorderly conduct can include fighting, excessive noise, and public intoxication. If you’re causing a disturbance while dumpster diving the penalty could become a fourth-degree misdemeanor with jail time and fines that could range between $150.00 and $1000.00, depending on the severity of the crime. The Ohio revised code 2913.01 describes the general definitions of theft and fraud including but not limited to forgery, credit card fraud, computer hacking, deception, and withholding property belonging to another. If you’re deemed guilty of identity theft you will be looking at paying fines from less than $1,000.00 to more than $150,000.00 and up to eight years of jail time. Of course, there are some general rules that do apply to dumpster diving in areas where it is legal. Obey Signage: If there are No Trespassing signs or notices of private property then it is considered illegal to dumpster dive in that area and you will be breaking additional laws if you disobey the signs. Obey Locked Gates and Fences: There might be a time when you encounter a dumpster that is located behind a locked gate or fence. Don’t break the lock and trespass into the area because that is against the law and you could set yourself up for expensive consequences. Don’t Litter: Have respect and clean up after yourself. Littering is an automatic offense whether a sign is posted or not, so avoid a costly penalty and clean-up after yourself. Stay on the Down Low: There is no reason to cause a disturbance while you’re diving for your treasures. Keep to yourself and don’t make a scene, remember that disorderly conduct is a crime. Respect Authority: If you’re asked to leave the premises, no matter if it’s the property owner or law enforcement, respect their wish and, after cleaning up after yourself, respectfully leave the premises. 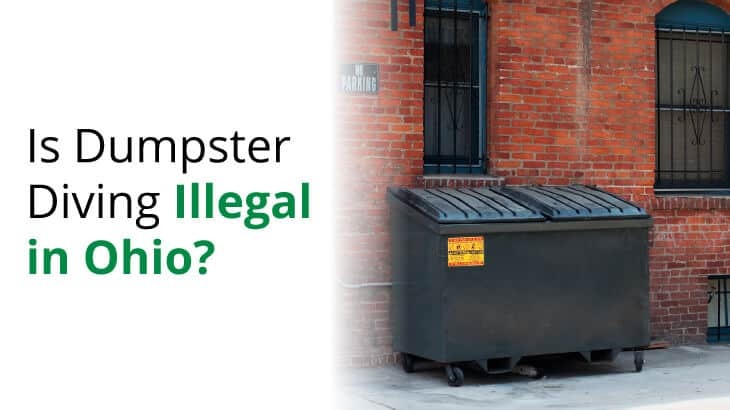 So, the question is dumpster diving illegal in Ohio should be clearer to you by now, but we would like to sum it up for you to be sure. 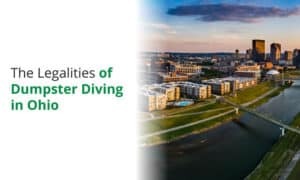 It is not illegal to dumpster dive in Ohio, however, there are city ordinances in place in each city that might state otherwise, so it’s a good idea to know the area before diving in. If you’re not sure about the laws in your municipality you can call a non-emergency phone number for your local police department or check with your local sanitation department for the laws about dumpster diving in your area. Disclaimer: the information contained on this website should not be taken as legal advice and should not be construed as such. We do not represent that the information contained herein is true, accurate, or complete. No attorney-client relationship is created, and no attorney compiled this information. The information contained is offered as information only and the reader can take it at his/her own risk. You should not rely on this information as legal advice or rely on it as an alternative to the advice of an attorney, counselor-at-law, or other legal source providers. If you have any questions about the legalities of the information contained on this website, you should seek legal advice.